Truck accident injuries are known for being some of the most disastrous and life-altering of any traffic crash. The size, weight, and high momentum of trucks make them ideal for causing painful impact and invasive collision injuries. However, sometimes it’s not just the pain of an injury that can take its toll; sometimes, the location of the injury can have just as much impact as the severity of the wound. This is especially true for individuals who suffer some type of physical trauma to the face or head. Whether the injury is minor or severe, its effects can cause the victim severe emotional distress. Glass from a broken windshield can lacerate the skin and eyes as it flies into your face. 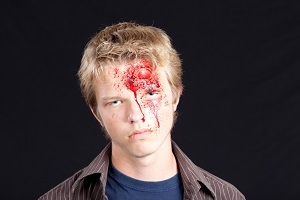 Impact force of slamming into a steering wheel can fracture your orbital bones, break your nose, and shatter your jaw. Fire or heat from a damaged engine can cause third-degree burns as it travels through the dashboard and across your face. The recovery process following an accident is twofold. You must heal your physical wounds as well as the emotional ones the accident left behind. Unfortunately, injuries to the face can be psychologically damaging for some people long after their physical wounds have healed. The scarring reminders of their accident remain front and center, making it difficult to close the emotional wounds. They know they can’t hide any facial disfigurement, and the stress and embarrassment of seeing, explaining, and worrying about the scars can be overwhelming. Social avoidance. This consists of avoiding social interaction, even with friends and family. The injury victim may especially avoid people who may be associated with the truck accident and resulting facial trauma. Mood swings. The injury victim may feel anxious, angry, irritable, or fearful. He may have bouts of depression, loss of interest, or loss of control. Suppressed focus. It’s common for trauma victims to feel numb or dazed, to have loss of motivation, or to experience trouble concentrating. Drug abuse. Traumatic experiences are often linked with misusing prescription drugs (including painkillers), abusing illegal drugs, or drinking excessive amounts of alcohol. If you or someone you love is suffering from any of the psychological issues listed above, it is important that you seek help from a professional therapist who has experience with treating accident victims. Facial trauma is too painful for you to have to worry about paying your medical bills while trying to heal. Thankfully, you don’t have to face it alone. Call attorney Steve Lee, a respected truck accident attorney in Houston, and let him take care of securing the compensation you deserve. You can also read about some of Steve’s former clients and their case results if you’d like to learn more. Who’s Responsible For Paying for Post-Accident Plastic Surgery?